WASHINGTON—Saying such infrastructure improvements were necessary to ensure citizens could continue to pass safely over the nation’s dangerous river rapids and precipitous chasms, Transportation Secretary Anthony Foxx called for $200 billion in funding Wednesday to repair the country’s rickety wooden bridges. 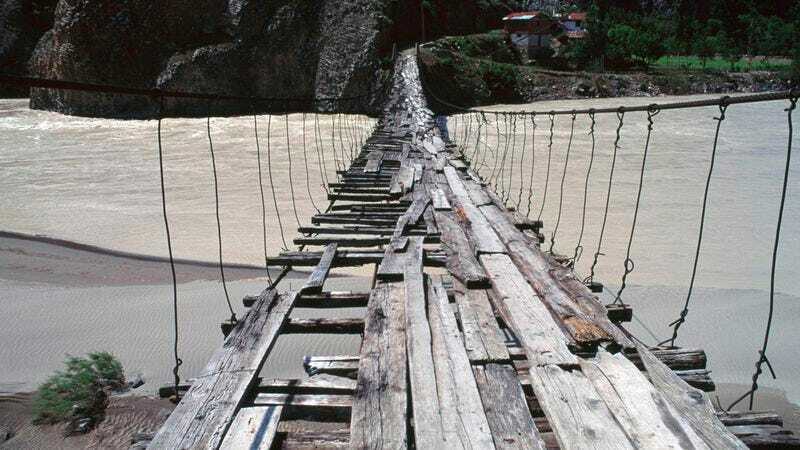 “A recent survey of wood-and-rope bridges throughout the United States found that most are unsafe for travel due to heavily frayed ropes and planks that have decayed to the point of imminent collapse, putting far too many adventurous and treasure-seeking Americans in danger,” said Foxx, adding that any wooden bridge repair bill put forth by Congress must include a substantial investment to fix the many long gaps of broken and missing slats that Americans can only currently traverse via treacherous leaps. “Sadly, there have already been numerous reports of these frail, swaying bridges failing in various parts of the country, oftentimes just mere moments after an individual finishes crossing them, typically leaving their traveling companion stranded on the other side, or worse, clinging precariously to a sheer cliff face. This is simply unthinkable in a nation as advanced as ours.” Foxx added that, unless sufficient funding was authorized in the near future, he would have no choice but to close many of the rickety wooden bridges nationwide, forcing Americans to make longer and more difficult commutes over rushing rivers by walking across the backs of full-grown crocodiles.